Ford’s Aston Martin-inspired grille made its way to the Fiesta for the 2014 model year, and the Fiesta is all the better for it. Though we didn’t get the Fiesta in the U.S. until 2011, its design actually dates back to 2008, so the new grille does much to bring the Fiesta into the new decade. While the styling update continues to make the Fiesta hatch a killer-looking subcompact, the update merely makes the Fiesta sedan less awkward-looking than before. While it’s easy to see that Ford was going for the mini-Fusion thing with the Fiesta sedans revised sheetmetal, it ends up looking a bit like a tadpole to me, with a big nose, and slim and slender rear-end. 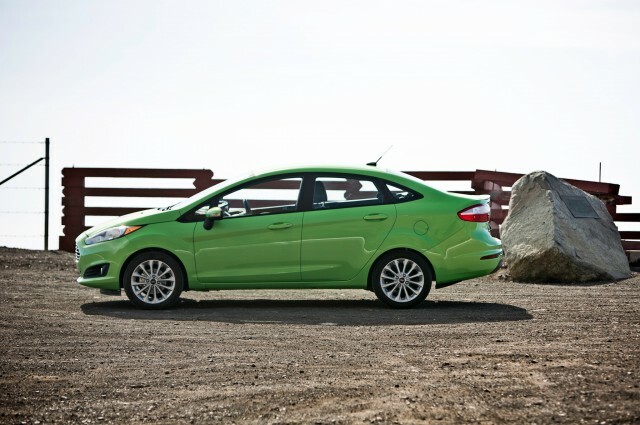 Attractive, the Fiesta Sedan is not. 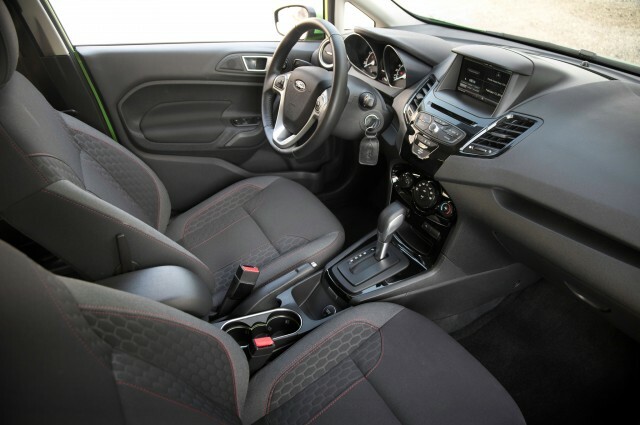 The interior of our mid-level Fiesta SE sedan is a bit of a mixed bag as well. Sure, MyFord Touch is now a completely functional and, dare I say, good infotainment system, and the interior’s overall design is functional and attractive, but there are a few minor complaints. The back seat is a bit tight for adults, and some of the interior trim feels cheap – most notably the piano-black plastic trim surrounding the shifter, which was popping off, and the chrome trim surrounding the cup holders, which seemed quite sharp. It’s worth noting that two of the Fiesta hatchbacks we also had in the fleet fared better in the interior department. 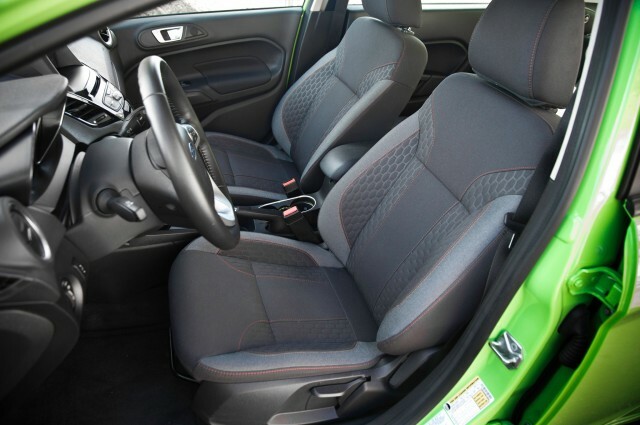 The Fiesta ST’s interior remained a wonderful place to be, even without the optional Recaro buckets, while the Fiesta Titanium’s interior felt solidly screwed together, and almost upscale. 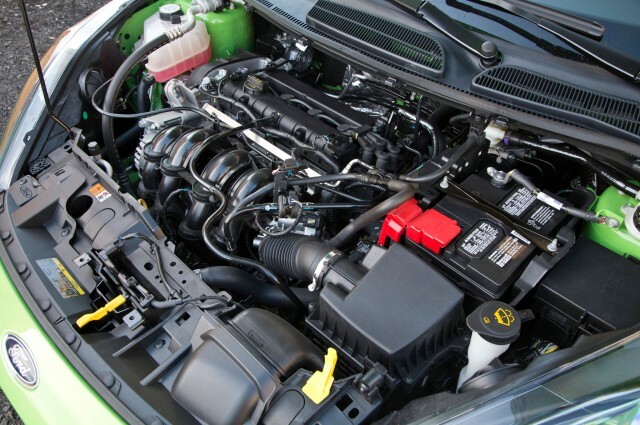 Unlike the Fiesta ST, which punches above its weight, the Fiesta is in about the middle of the pack when equipped with the base 1.6-liter I-4. Though we wouldn’t go so far as to call the 120-hp and 112-lb-ft of torque 1.6-liter I-4 underpowered, it certainly isn’t quick when equipped with the six-speed dual-clutch automatic. 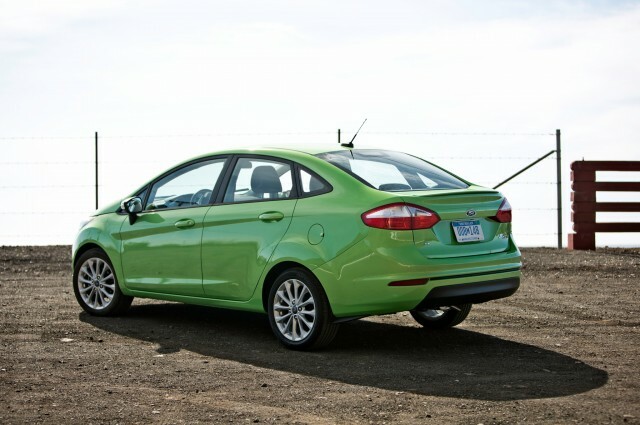 Our Fiesta sedan tester accelerated from 0-60 mph in 9.5 seconds, and ran the quarter mile in 17.2 seconds at 80.4 mph. The same 2014 Fiesta SE sedan managed to complete the figure eight in 28.4 seconds at 0.62 g average, and average 0.84 g on the skidpad. The Fiesta sedan needed 118 feet to come to a stop from 60 mph. Outside the confines of the test track, the Fiesta is a bit more impressive. 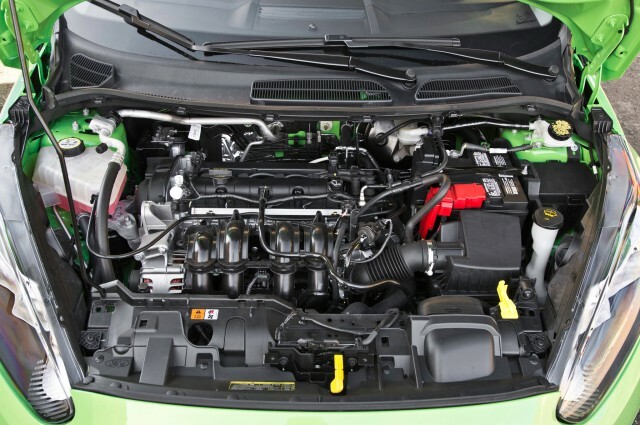 The naturally aspirated 1.6-liter is fine around town and under moderate acceleration, but it quickly runs out of steam; the Fiesta could really use more torque. 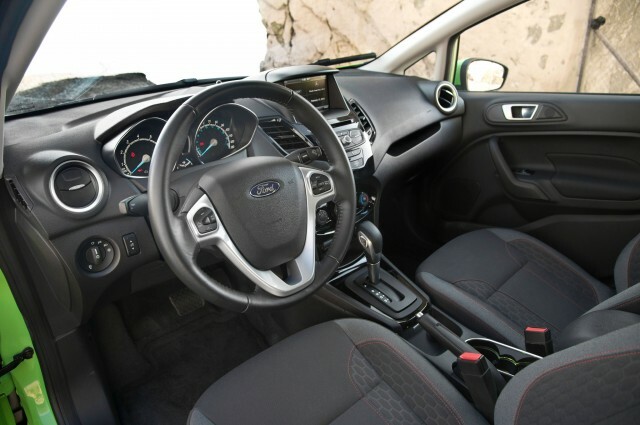 The Fiesta’s dual-clutch is lackluster too, with slow, lazy, automatic-like shifts. The Fiesta’s problems are all solved by a manual transmission, though. The Fiesta Titanium hatch I drove felt like an entirely different car. Freed of the dual-clutch, the engine eagerly revved to its redline and the car became genuinely fun to drive. The five-speed manual really makes a world of difference. 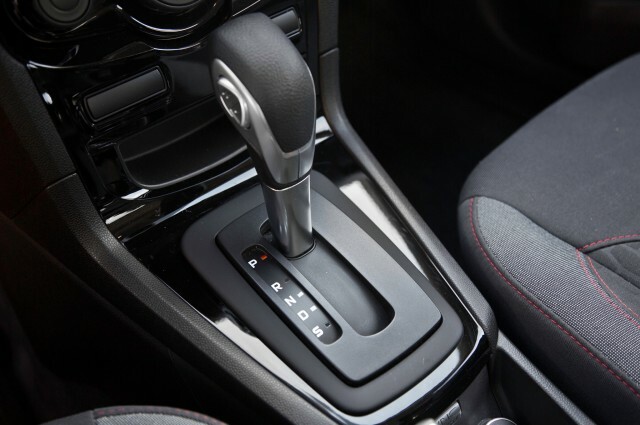 A manual transmission is also, of course, the only way Ford to get a turbocharged engine on the Fiesta – the excellent 123-hp and 148 lb-ft Fiesta SE EcoBoost is only available with the five-speed manual, while the Fiesta ST gets 197 hp and a six-speed manual. While the driving experience greatly changes with transmission choice, the Fiesta’s steering remains quick, light, and accurate no matter the body style or trim. The EPA rates the Fiesta automatic at 29/39/32 mpg city/highway/combined, no matter the body style, while the manual is rated at 33/40/36 mpg. 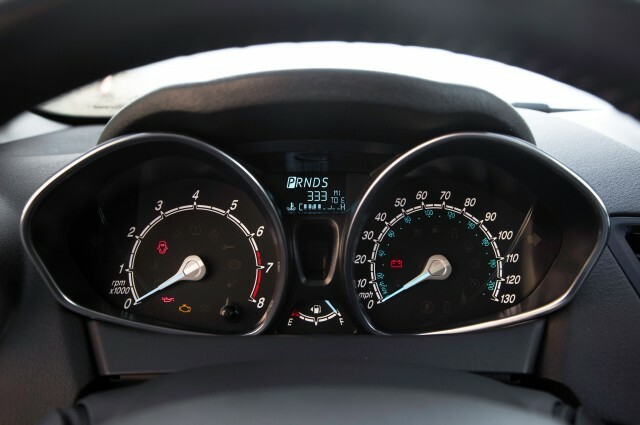 Our Intellichoice Real MPG testing found more variance between transmissions and body styles. 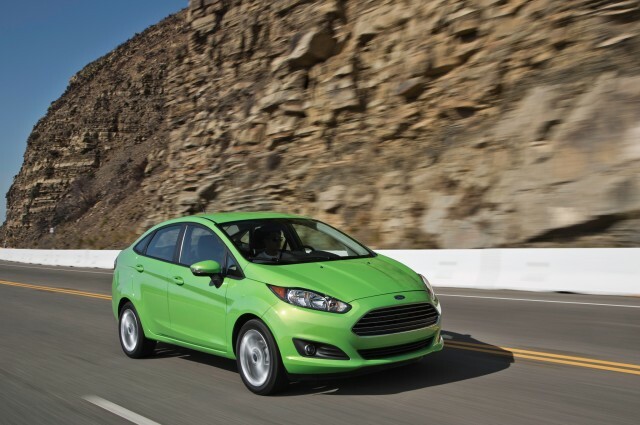 The 2014 Fiesta SE sedan automatic achieved 30/44/35 mpg on the Real MPG cycle, while a Fiesta SE hatch automatic achieved 32/42/36 mpg on the Real MPG cycle, showing that sedan’s slipperier shape helps it on the highway, but hurts it in the city. A 2014 Fiesta Titanium hatch equipped with the five-speed manual achieved 33/40/36 mpg on the Real MPG cycle. While no compact (save for the Chevy Spark) fared particularly well on the Insurance Institute for Highway Safety’s (IIHS) small-overlap test, the Fiesta was still an IIHS Top Safety Pick last year. 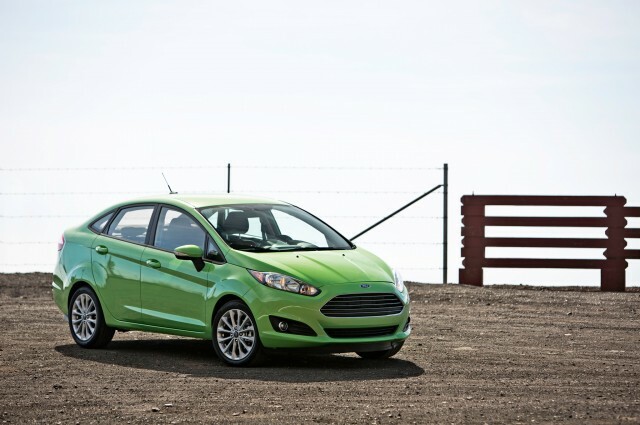 The federal government gives the Fiesta a four-star rating overall. 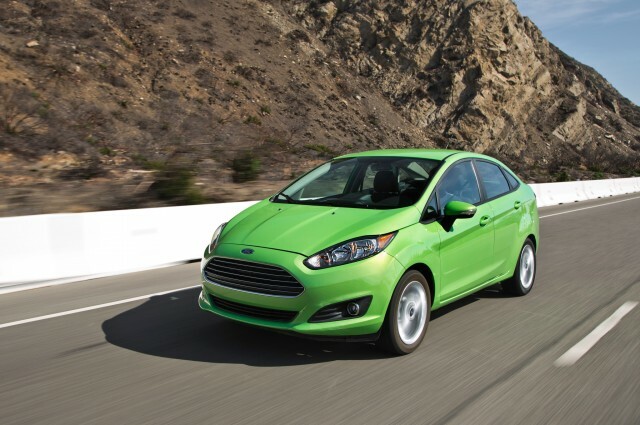 The 2014 Fiesta SE sedan starts at $16,245 and was a fair value at our $19,725 as-tested price. 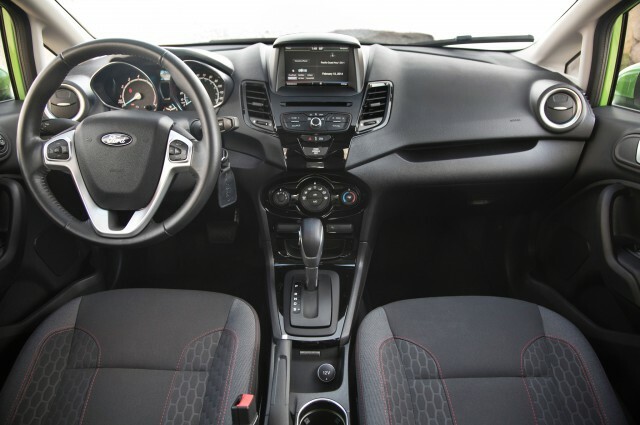 Our Fiesta was well-equipped for the segment; the $995 Equipment Group 201A pack gives the Fiesta Sync with MyFord Touch, 16-inch alloy wheels and a deck lid spoiler, and $795 added navigation to the car. Our tester’s only two other options were the $1095 dual-clutch transmission, and the love-it-or-leave-it $595 Green Envy paintjob. Ultimately, the Ford Fiesta performs its intended function of getting its driver and passengers from point A to point B well, in an efficient, comfortable, and attractive fashion. But does it do it well enough to have earned it the Car of the Year calipers? We’re divided. Jonny Lieberman said it would have. But the CTS was a great example of having the whole lineup perfect in order to win. With the Fiesta, Ford’s got a phenomenal hot hatch, and a excellent fuel-sipping model. If Ford would give the bread-and-butter Fiesta some love, it could have an award-winner on its hands.